May 25, 2018 /33 Comments/in European New Right, Featured Articles /by Andrew Joyce, Ph.D.
After 40 years, and following translations into Italian and Portuguese (1981), German (1984), and Romanian (1998), we finally have an English translation of Alain de Benoist’s 650-page magnum opus. Vu de Droite: Anthologie critique des idées contemporaines was first published in 1977 when de Benoist’s GRECE (Research and Study Group for European Civilisation) think-tank was at the height of its influence. It took the French political and intellectual worlds by storm, receiving widespread attention in the mainstream press and winning the Grand Essay Prize from l’Académie française in June 1978. It is little short of remarkable that we should have to wait four decades for an English translation of a text with such critical acclaim and intellectual pedigree. Credit for bringing about the English translation (published in three handsomely designed volumes and with an updated 2001 Preface) is due to Arktos Media, founded in part in 2010 with the goal of bringing the works of de Benoist to an anglophone readership. A final push to ensure translation of Vu de Droite was initiated in 2016, when seventy-three backers contributed a combined total of around $10,000 via kickstarter.com to bring the project to completion. The dedication and generosity of all involved was not in vain. Although we eagerly await the imminent publication of Volumes Two and Three, the first volume (published in late 2017) is an invaluable work in its own right. Intellectually thorough yet written with admirable economy and agility, View from The Right Volume I: Heritage and Foundations is a useful tool, an invaluable point of reference, and a resounding call to action which has lost none of its relevance or vitality in the decades since its first printing. 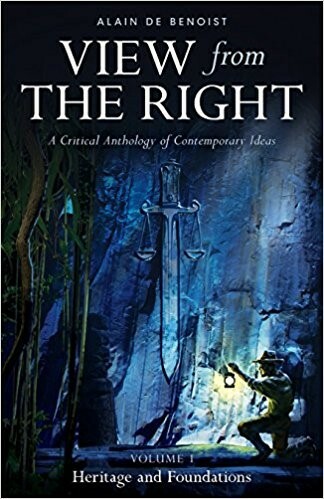 The central purpose of View from The Right is to break the taboo on the assertion of right-wing ideas and to present clearly defined intellectual positions (or pathways to positions) on a wide range of subjects as they pertain to right-wing thought. In Volume I, these positions pertain to matters of European racial and cultural heritage, and the broader foundations of contemporary right-wing ideologies. The author describes (ix) his intention to “prepare a portrait of the intellectual and cultural landscape of the moment, to establish the state of affairs, to signal the tendencies, to open the pathways and provide benchmarks to aid (and incite) the task of thinking in a world that is already in the process of considerable change.” For the most part, this effort takes the structural form of powerful and succinct essay summaries of the state of current mainstream scholarship on a number of crucial and fascinating topics. These summaries are then supplemented with commentary from de Benoist and developed still further in his very generous footnotes. Translator Robert Lindgren also deftly assists the reader by occasionally including his own useful commentary on the text, along with a number of very helpful translations and updates of de Benoist’s scholarly citations. I hereby define the right, by pure convention, as the consistent attitude to view the diversity of the world, and by consequence the relative inequalities that are necessarily the product of this, as a positive thing; and the progressive homogenisation of the world, extolled and effected by two thousand years of egalitarian ideology, as a negative thing. I call of the right those doctrines that believe that the relative inequalities of existence include the relations of force of which historical becoming is the product — and which deem that history must continue — in short, that ‘life is life, that is to say a combat, for a nation as for a man’ (Charles de Gaulle). De Benoist thus defines as his true enemy not ‘the left,’ ‘communism,’ or even ‘subversion,’ but ‘the egalitarian ideology.’ I recently saw it remarked on social media that the 2001 Preface to View from the Right, a magnificent anti-egalitarian polemic, was alone worth the purchase price. It’s difficult to disagree and, to my mind at least, the Preface, an immensely important essay in its own right, is one of the most concise, coherent, sophisticated, and forceful condemnations of modern egalitarianism ever published. The author remarks at the outset that in 1978 the right-wing stance of the book was no obstacle to getting reviews in the mainstream press. Today, “this tendency is brutally reversed. The rise of ‘uniform thought,’ exploited by those whose interests it could best serve, has done its work.” A zone of “ostracism and prohibition” has steadily exiled all but the most conformist of thinkers to the fringes of culture. Despite manufactured discourse within the mainstream, we witness there only the “complete obsolescence of the right-left split,” the only difference between the mainstream factions being the fixation of the ‘right’ with “the logic of profit,” and the fixation of the ‘left’ with “the progressive homogenisation of the world.” Both goals, quite obviously, feed effortlessly into the globalist project. The equality of everything ‘that has a human face’ is incapable of providing the foundation for a state, a state form, or a form of government. No distinctions can be derived [….] Nothing distinctive can be deduced in morality, religion, politics, or economics from the fact that all people are human [….] The idea of human equality does not furnish any legal, political, or economic criteria […] An equality that has no contents except for the equality common to all men will be an apolitical equality, because it lacks the corollary of a possible inequality. … An equality without the possibility of inequality, an equality that one has intrinsically and that one can never lose, is without value and indifferent. In this reading then, the naturally individualistic European has been deceived into asserting a false and harmful individualism while the foundations of his true individualism are being eroded under his nose. “I am a free man within my community and my nation,” a statement full of meaning, has become “I am a free man within the world,” a mere empty slogan. Stage right, the ‘man of the right,’ usually a gentleman of a certain age, well dressed, well groomed, always smiling, full of good intentions, completely unconscious of the stakes of the discussion. And stage left, some young wolves of the extreme left, bearers of a worldview having its own consistency, refusing the least concession, versed in the art of dialectic, in the play of paradigm and syntagm, who tear their interlocutor to pieces. I think that current society is a reflection of these debates. In View from The Right, de Benoist asks us to go on the intellectual offensive; to have a position on every new scientific and cultural development and to assert this position aggressively and unapologetically. Within human society, remarks the author, “nothing is neutral.” The left, well-versed in ‘Gramscianism’ and the Frankfurt School has not neglected this reality, and its fundamental starting point for the development of its own position on social and scientific developments has been radical critique or, in de Benoist’s phrasing (10), “the questioning of everything.” View from The Right offers pathways to counter such efforts by fleshing out our understanding of scholarship in key areas, performing an ideological critique of the left and identifying where the right may form its own ideological positions. What does the right have to say about child rearing? About evolutionary psychology and sociobiology, behavior genetics, historiography, sociology or microphysics? Where such positions have already been developed, de Benoist offers useful summaries and suggests further areas for exploration. Where there is a total lack of attention from the right, de Benoist opens these subjects up with admirable clarity and depth. Reviewing the findings of Indo-European Studies one is left asking what precisely is so threatening about it. The answer probably lies in the potential of the field to contribute to a common European ethnic consciousness by affirming that the Indo-Europeans were themselves an ethnic phenomenon as revealed by recent population genetic research. The left likely sees ethnicization of the Indo-Europeans as promoting the development of perceptions of group interests based on such a consciousness — a group consciousness of a heroic past peopled by conquerors, explorers, and innovators. De Benoist offers an admirable and still current overview of the most relevant ideas and developments in the field, my only advice being that anyone wishing to see an ideologically practical application of such ideas (in the form of a direct response to Marxist anthropology) should follow their reading of de Benoist by consulting Ricardo Duchesne’s excellent commentary on the Indo-Europeans in his The Uniqueness of Western Civilization. In 1965, anti-psychiatrists in London set up an ‘experimental community center’ at Kingsley Hall. Patients and doctors lived together. On equal footing. ‘In this hospital,’ says Jean-Michel Palmier, ‘no constraint is imposed on the sick, there are no tranquilisers, we get up and eat when we want, we make love with who we want. There are no longer any sick people, but individuals who have sought refuge in this community because life has become impossible for them.’ But very quickly, difficulties magnified. One of the ‘boarders’ took up the habit of keeping her excrement and smearing it on the wall of her room, which adjoined the kitchen. ‘There were meetings,’ indicates one of the doctors of the center, ‘to decide whether or not that person had the right to do this, as well as to do whatever she wanted in her room. It was then found that the extent of the smell was greater than the extent of the room. She was asked to reduce the extent of the smear of her excrement.’ The ‘experiment’ ended in 1969. A hundred patients found themselves on the street. Such instances are enough to leave one speechless. De Benoist urges the opposite response — to aggressively condemn the left and confidently articulate a view from the right. His book is an invaluable contribution to the cultivation of such a sensibility, and to the confident intellectual assertion of our worldview.